We are offering a wide range of PP Filter Presses. By keeping track of current market development, we are offering an excellent range of Polypropylene Filter Press. This filter press is widely known for its use in excellent filtering process in many industries such as chemicals and pigments, minerals and inorganic products/mining and metallurgical products. By using Marble & Mines PP Filter Press in the above process the total operation of slurry disposal through tanker thereby wasting a large amount of water & increasing recurring expense of tanker transportation can be avoided. Apart from this the whole process is environment friendly. We offer 36"36"x60 plate & frame type PP standard filter press with ratchet tightening arrangement. We have an exclusive range of PP Filter Press offering to our clients. Extensively demanded in the industry, this filter press is highly appreciated by our esteemed clients. 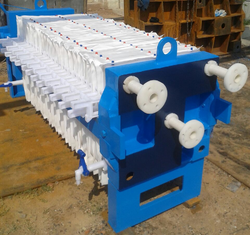 We offer this filter press at market leading price to the clients. We are the Prominent supplie of the Filter Press. Inclined at 40 Deg- Increased operational efficiency, inclined at 75 Deg in case of coarse screen. We are a remarkable entity in this domain, engaged in offering a qualitative assortment of PP Filter Press Machine.